Cutting: A massive complex wine with cherry, blackberry, violets, licorice, pepper and many other characteristics. The Seghesio Cortina Zinfandel from Dry Creek Valley is a massive and complex wine featuring cherry, blackberry, violets, licorice and pepper aromas and flavors. Various tasters observed a wide range of other aromas and flavors including cocoa, cola, spices and many others. 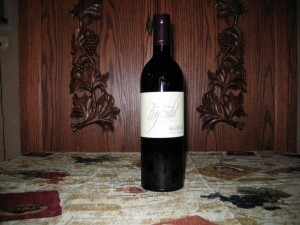 This medium to heavy bodied wine has a spectacular long finish. Our senior Zinfanatic rated this the top wine in the tasting, but it may be too much for individuals who prefer simple wines.